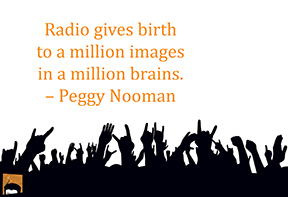 Since Radio uses interruption advertising, listeners should be treated to your message, not tortured by it. Tell your story- and make it worth hearing. Give a call to action, instead of a call to spin the dial. How do we do that? By delivering, in lengths from five seconds to sixty seconds or more, a message worth listening to. Don't get me wrong. I can write your joe-basic commercial. People will hear it and say, "yup. That sounds like a professional, polished radio commercial." That's...not always a good thing. If they know it's a commercial, they won't be as apt to listen to it. But if it's a story? They'll stop for that. Since it's interruption advertising, you just made it worth the interruption. Let's look under a Magnificent Cowlick and see what ideas pop up! Below are several commercials, and yes- jingles even, created by yours truly. I wrote all of them, and mixed and voiced many of them. Several have won awards from the Missouri Broadcasters Association, and the Kansas Association of Broadcasters. Call me or mail me. Let's see what's the right fit for you. Commercial Voiceover: $100 for :30 or :60, KC Market. Please ask for details on number of edits/retakes allowed.